Lua error in Module:Location_map at line 488: Unable to find the specified location map definition: "Module:Location map/data/United Kingdom Surrey" does not exist. Epsom is a town in northern Surrey. The town is known for its race course and the horse race held there. The town also gives it name to epsom salts which are found in mineral water here. 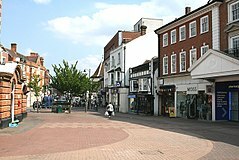 By the end of the Georgian period (early 1800s) Epsom was a spa town. Some remains of this are its water pump, wells and exhibits in the town's museum. A housing estate has been built upon the wells in the south-west of the town. 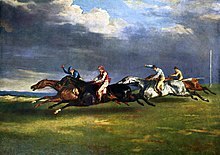 Epsom Downs Racecourse which hosts the Epsom Derby; painting by Théodore Géricault, 1821. ↑ "History". Epsom Downs Racecourse. Retrieved 11 July 2015. This page was last changed on 18 April 2019, at 08:35.